The Hebrew word for shield in this promise is a substance so thick that it is likened unto the scaly hide of a crocodile. God is our shield and our protector. Nothing can get through His defenses. Our God and Father is also our glory, which is the Hebrew word 'kabowd', which means a weighty honor that He places on us simply because we belong to Him. I love the NLT Bible translation for this verse... '3 But you, O Lord, are a shield around me; you are my glory, the one who holds my head high.' 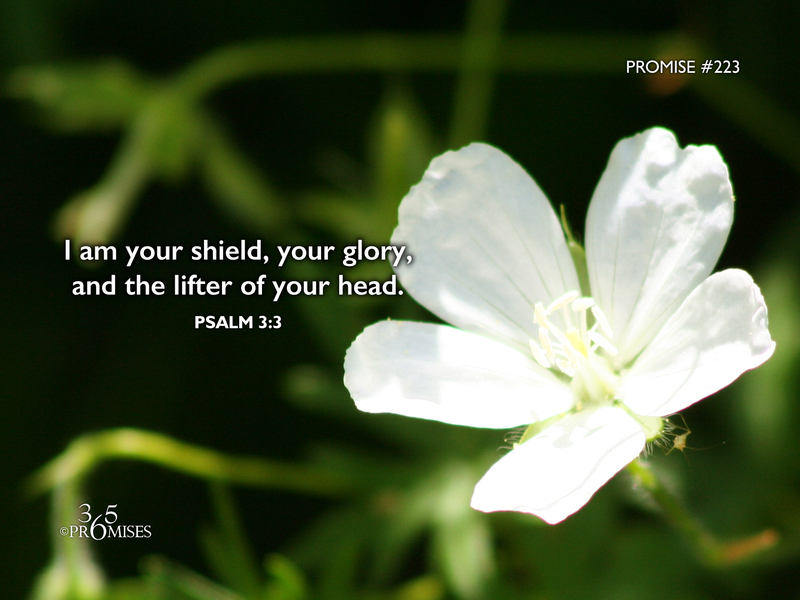 God protects us, He bestows His own glory on us, and He lifts up our head when we are discouraged. When I think of the last part of this promise, I picture a child standing face to face with his father, with his head held down in discouragement. The father not wanting his child to be discouraged, gently puts his finger on the little boy's chin and raises his head until their eyes meet. When we get discouraged, our God and Father is the lifter of our head. As the NLT Bible says, He is 'the one who holds my head high'. If you are disappointed today, may you feel the loving touch of your Father raising your head so that your eyes meet His loving glance.